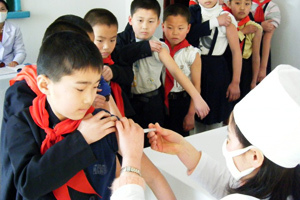 A million North Korean children were vaccinated against hepatitis B in a campaign run by the Ministry of Health with Caritas support in 2010. The children, aged from six to sixteen, are from North and South Pyongyang, but an extended campaign aims to reach close to four million children countrywide. It was not without its hitches though. In May, transport approval for vaccines and syringes was withheld by the South Korean government. Tension was high between the two Koreas after a South Korean warship was sunk in March. At the Caritas Korea Country Group meeting in Seoul in June, Caritas Internationalis Secretary General Lesley-Anne Knight asked for the North Korean people’s daily struggle to meet their needs not to be forgotten.